Monday's Storm To Bring Lowland Rain & Mountain Snows. 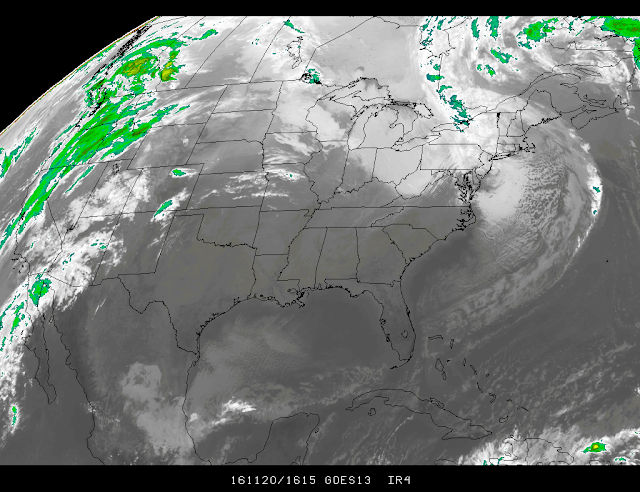 Infrared Satellite Image @ 9:15 AM MST This Morning. 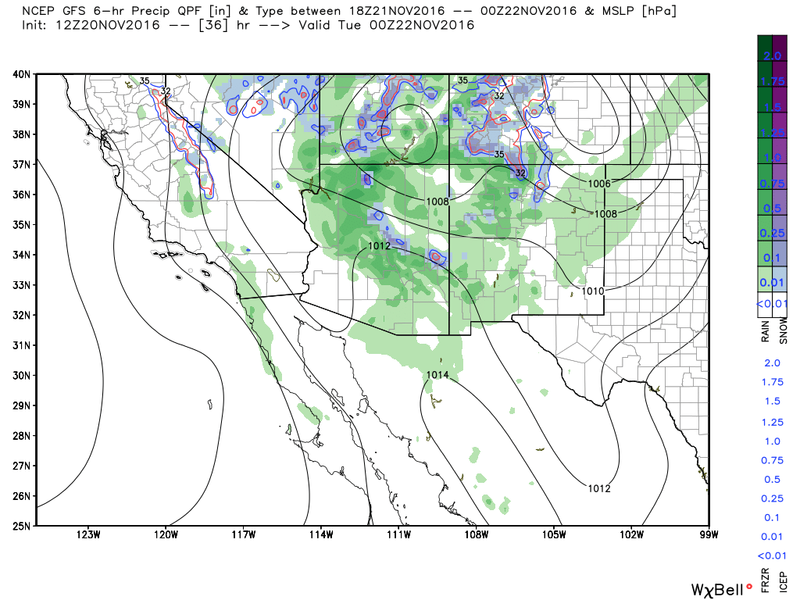 GFS 500 MB Forecast Valid @ 5 PM MST Monday. Surface Map Forecast Valid @ 5 PM MST Monday. Surface Precipitation Type Forecast Valid @ 5 PM MST Monday. 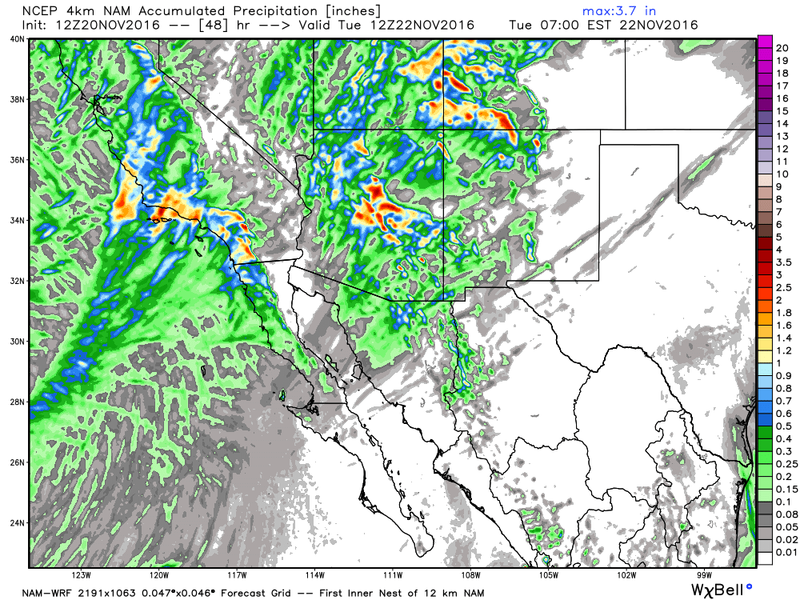 NAM Storm Total Rainfall Forecast Valid @ 5 AM MST Tuesday. NAM-WRF Storm Total Rainfall Forecast Valid @ 5 AM MST Tuesday. 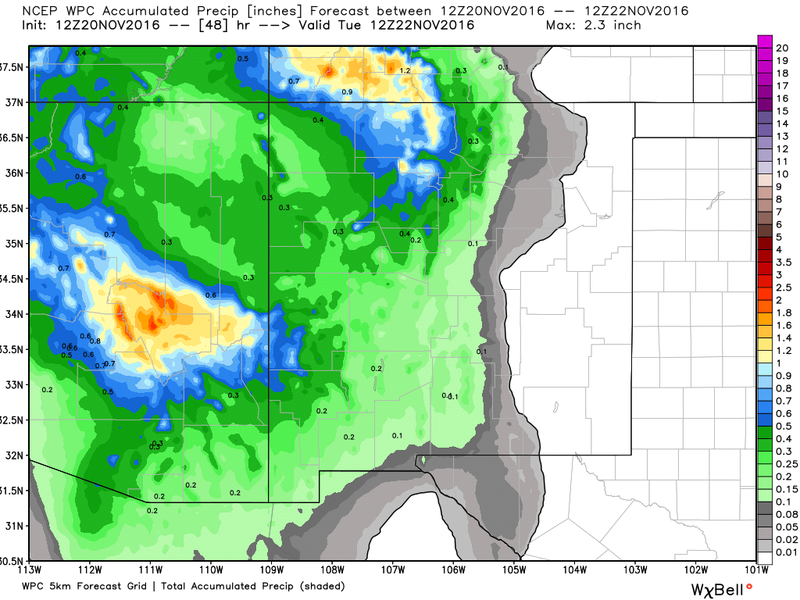 NWS NDFD Storm Total Rainfall Forecast Valid @ 5 AM MST Tuesday. WPC Storm Total Rainfall Forecast Valid @ 5 AM MST Tuesday. GFS Storm Total Rainfall Forecast Valid @ 5 AM MST Tuesday. 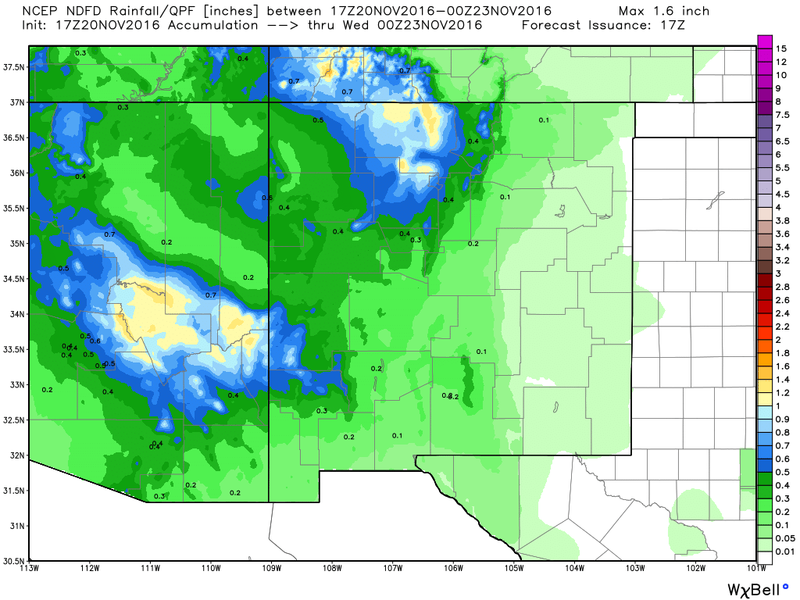 NWS Albuquerque Storm Total Rainfall Forecast. 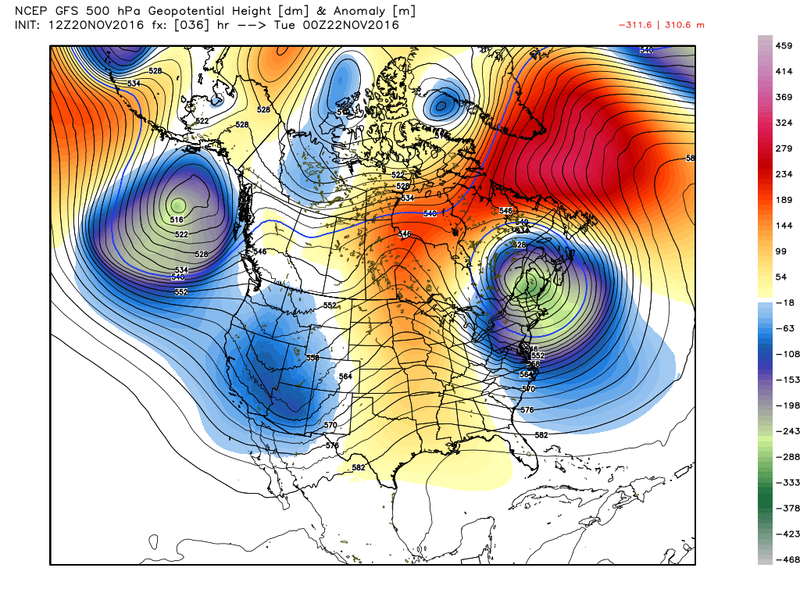 New Mexico's next storm is centered west of San Francisco this morning. 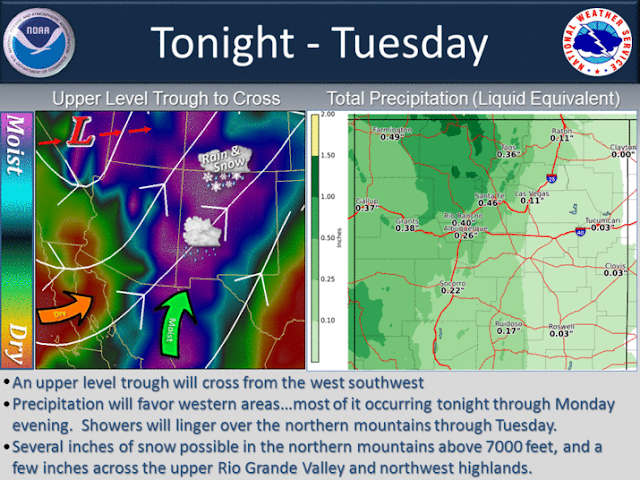 This upper level trough of low pressure is forecast to move east and southeast today and into Monday, reaching Northern Arizona late Monday afternoon. 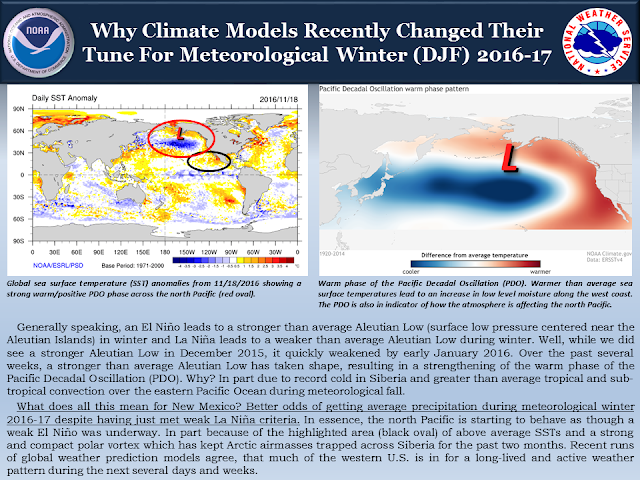 It will then swing across New Mexico Monday night into Tuesday. Mid level moisture is currently being drawn northward ahead of the storm from south of Baja, Mexico. This moisture will overspread New Mexico today into Monday as the trough approaches from the west. 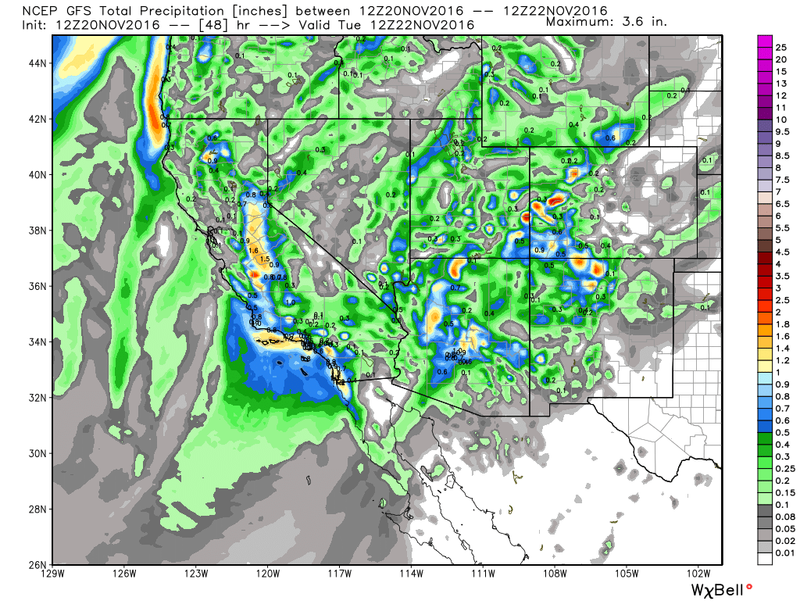 Low level moisture is in short supply across the area so the storm will be somewhat moisture starved as it moves across the state especially in Southeastern New Mexico. Scattered rain showers and perhaps an isolated thunderstorm or two will spread across Southern New Mexico tonight into Monday night. Small hail will be possible with a few of the stronger thunderstorms. 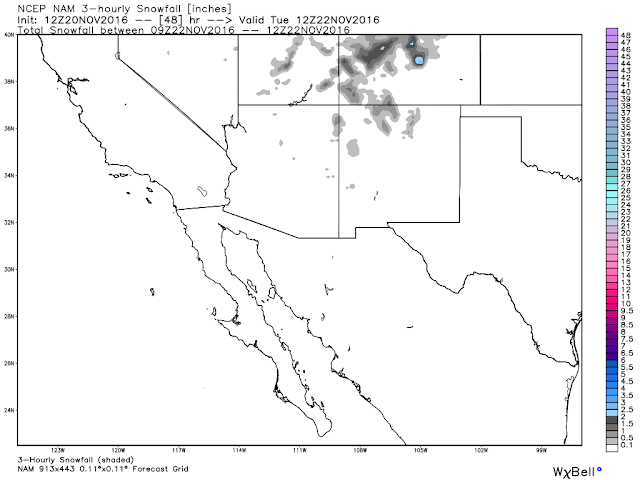 A slight chance for a few light rain showers across the Southeastern New Mexico will occur Monday into Monday evening. Our afternoon high temperatures will be near 70 to the low 70's today into Tuesday. A Pacific cold front will move from west to east across the area on Tuesday dropping our high temps about 10-degrees Wednesday and Thursday. 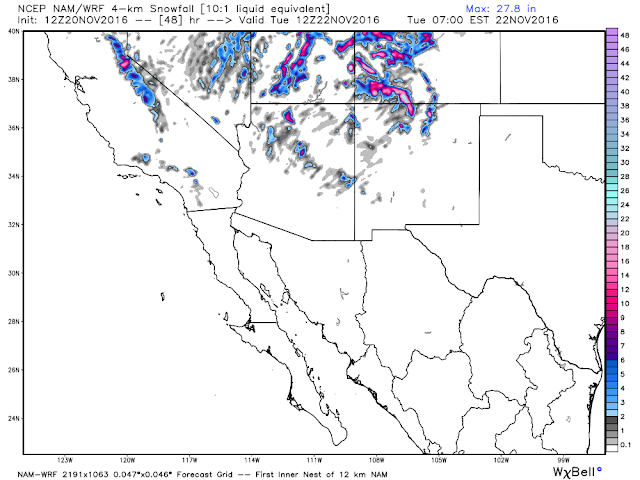 NAM Storm Total Snowfall Forecast Valid @ 5 AM MST Tuesday. 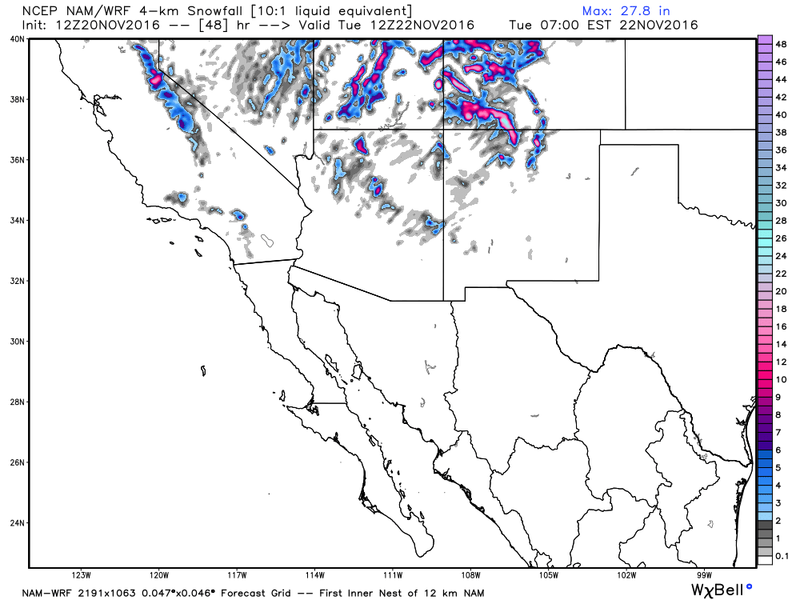 NAM-WRF Storm Total Snowfall Forecast Valid @ 5 AM MST Tuesday. NWS NDFD Storm Total Snowfall Forecast Valid @ 5 PM MST Tuesday. 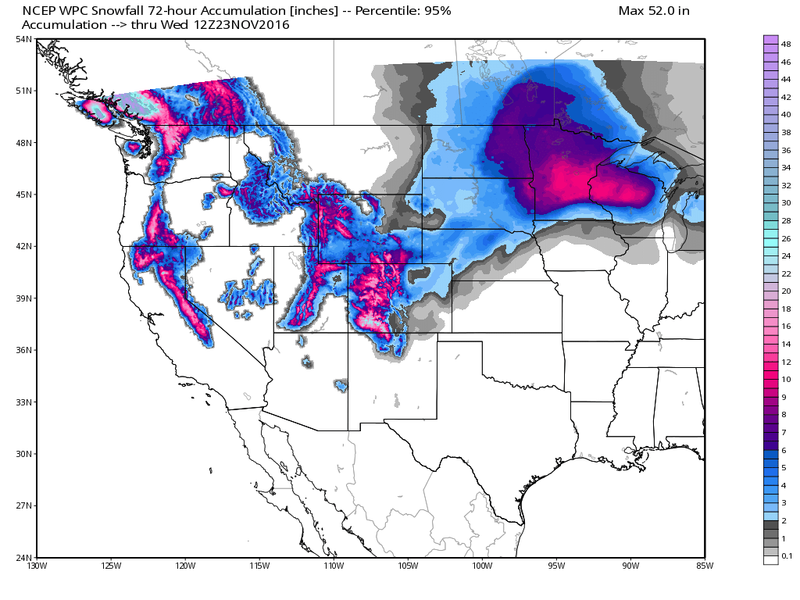 WPC Storm Total Snowfall Forecast Valid @ 5 AM MST Wednesday. 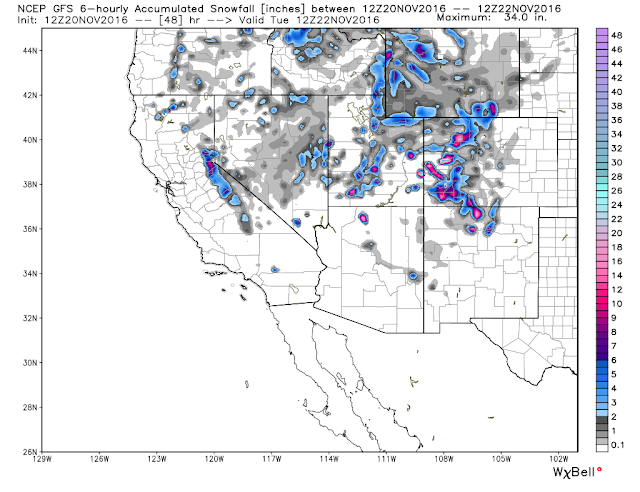 GFS Storm Total Snowfall Forecast Valid @ 5 AM MST Tuesday. 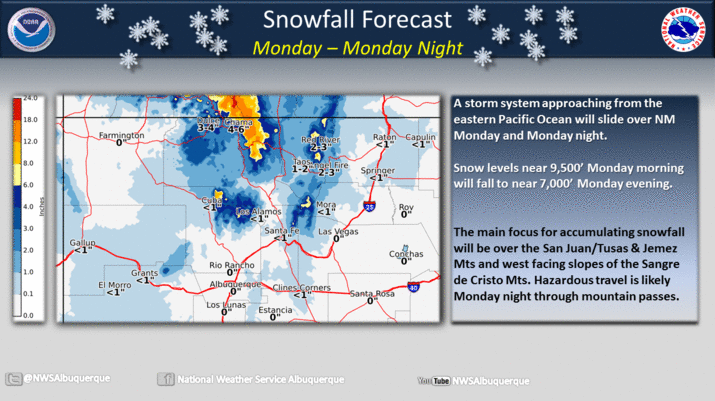 NWS Albuquerque Storm Total Forecast. Snow levels are forecast to be around 9,500' Monday morning dropping down to around 7,000' by Monday night across the Northern one half of New Mexico. 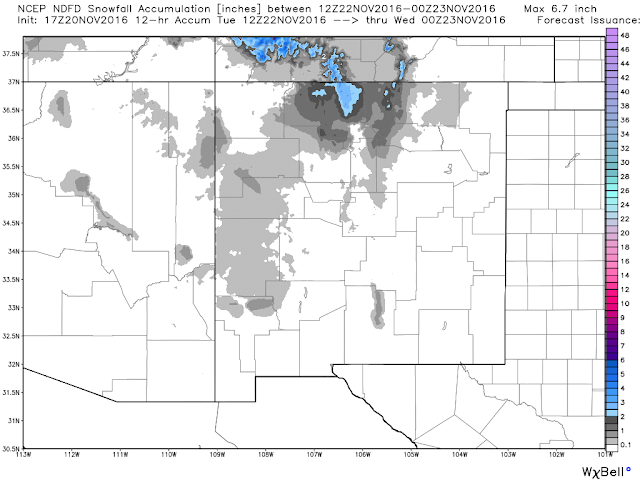 Across Southern New Mexico snow levels are forecast to be around 10,000' early Monday dropping down to around 8,000' by Monday night. The heaviest snows are forecast to fall near the New Mexico and Colorado state line. 8" to 10" currently look possible in the highest elevations around the Chama area. 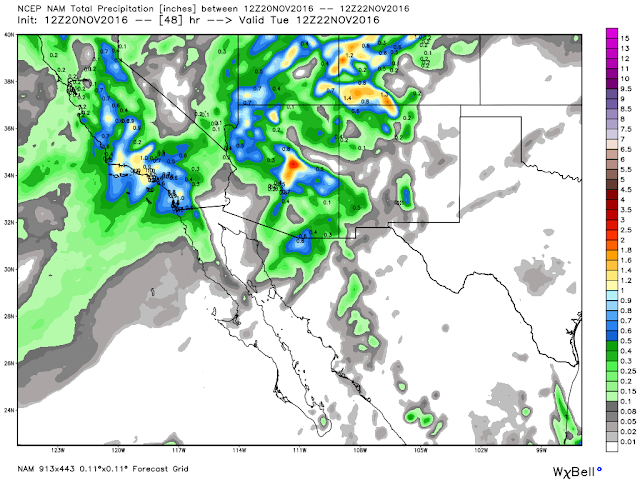 The Sacrament Mountains are currently forecast to see a rain and snow mix on Monday with all snow by Monday night. Current forecasts indicate an inch or less. 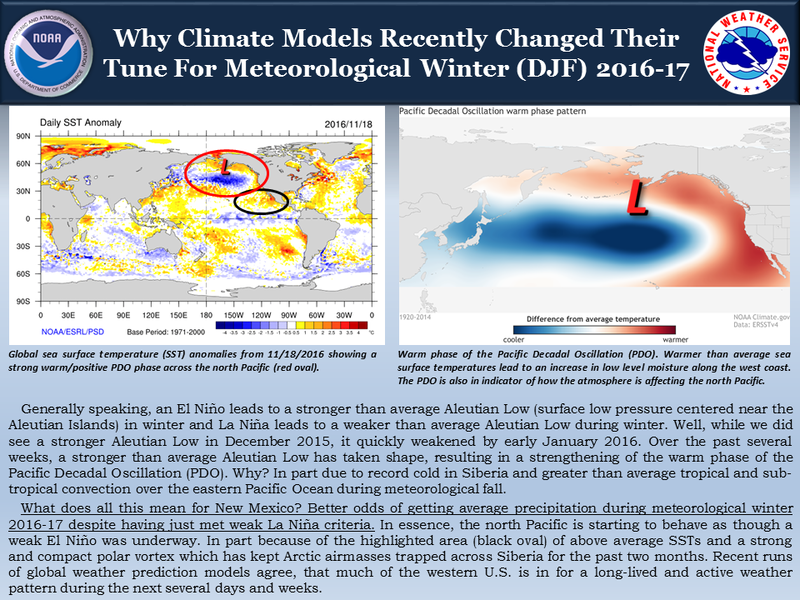 I suspect that the higher elevations of the Sacramento and Capitan Mountains above 9,000' may pick up more than this though. 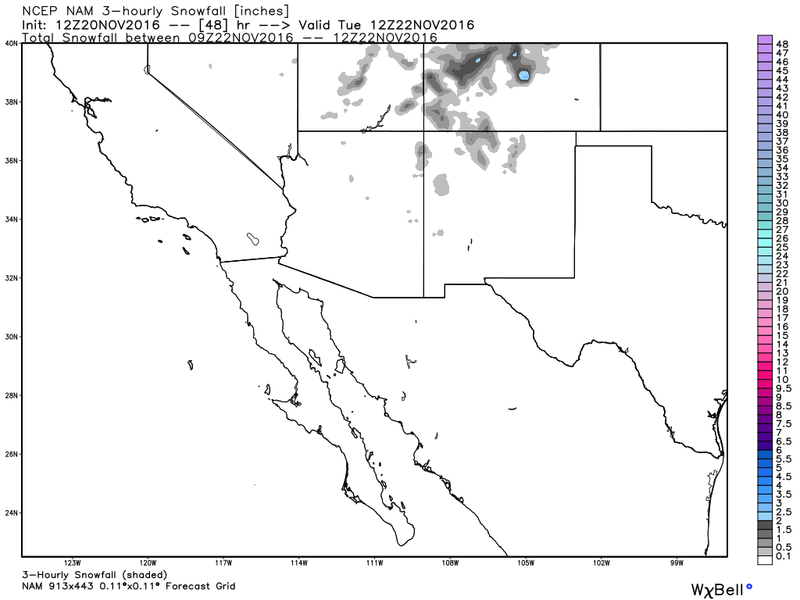 Long Range Forecast Pointing To A Colder & Snowier Winter For New Mexico.